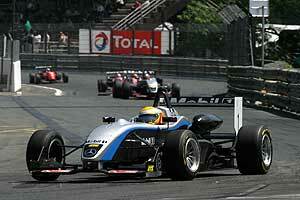 The third round of the 2005 Formula 3 Euro season, held on the streets of Pau, France, turned out to be plain sailing for Lewis Hamilton (ASM F3, Dallara-Mercedes). The British pole-sitter took the lead right at the start and defended it until he crossed the finish line flag after 25 laps at the 2.67-kilometre street circuit. 9.39 seconds behind the winner, Loïc Duval (Signature-Plus, Dallara-Opel) crossed the line in second position, with James Rossiter (Signature Plus, Dallara Opel) finishing third. While pole-sitter Lewis Hamilton succeeded in defending the lead, his second placed team-mate, Adrian Sutil, lost several positions as he experienced some problems when trying to change to first gear. And when the wheel of his car was hit by Esteban Guerrieri (Team Midland Euroseries, Dallara-Toyota), Sutils race was over after just some metres. In the early stages of the race, Franck Perera (Prema Powerteam, Dallara-Opel) was the closest chaser of the clearly leading Briton, Lewis Hamilton, but in lap four, Perera had to retire due to a suspension failure, thus offering Loïc Duval and James Rossiter the chance of moving up to second and third positions respectively. Both succeeded in defending these positions to secure a podium finish. Rookie Guillaume Moreau (Signature, Dallara-Opel) impressed by finishing fourth in his home race, thus taking the best result in his Formula 3 Euro Series career so far. Sebastian Vettel (Mücke Motorsport, Dallara-Mercedes), the second best rookie of the race, pressurised Giedo van der Garde (Team Rosberg, Dallara-Opel) for quite a while, but at the narrow street circuit, he just didnt find a way to pass his Dutch rival. Therefore, Heppenheim based Vettel had to settle for seventh place.